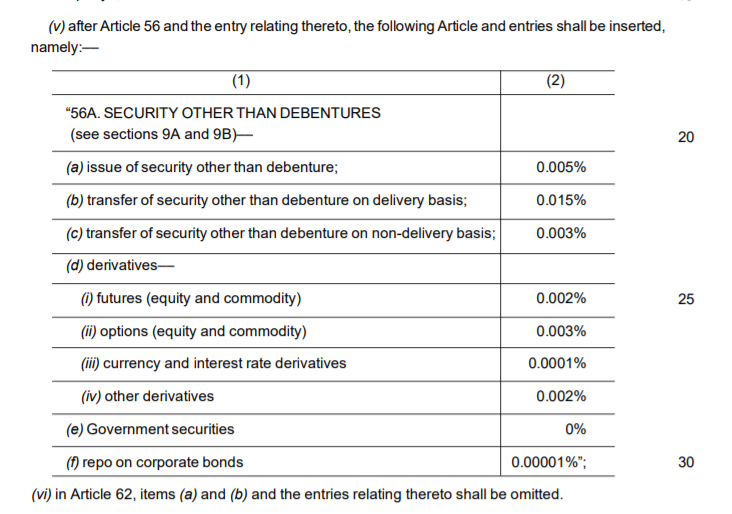 Stamp duty is charged per contract note and based on traded volume. Until now stamp duty was charged at different rates by the respective states. Brokers used to collect from clients and pay to the respective state government. Check this link to see how much you are currently paying. Most states were in the range of Rs 200 to Rs 300 per crore for intraday/derivatives. Some states like Telangana, Haryana, etc had a maximum cap per contract note which was great. This budget, stamp duty has been made uniform across all states. Page 14 on the finance bill. One rate for all makes it a level playing field. The rates are generally lower for most states - by almost 50% (except which had a maximum cap per day). So lesser transaction cost for active traders. Brokers had to earlier worry about collecting and paying to all the states, exchanges will do it now. A lesser operational burden on brokerage firms. Over 50% of trading volumes on exchanges are contributed by HFT firms/Prop shops who are themselves members on the exchange. There was no stamp duty on prop trading as a broker who trades for himself doesn’t have to generate a contract note. First reading, it seems like all of them will also have to start paying stamp duty. Most of them run arbitrage strategies which generate large volumes with very thin margins. This stamp duty cost will definitely increase the transaction cost significantly and can potentially bring down the trading volumes on the exchange. Lower trading volumes mean higher impact cost for everyone else. The broking community will surely make a representation to get this clarified from the Govt, ideally, there should be no stamp duty on such trades that are executed for your own self. awesome news for people like me from south india, any reduction in STT , gst ? It does not sound right that Prop trading is not paying stamp duty. Making them is making things uniform and level. It should be welcome. I do not think brokers will get away from this now. Stamp duty is transaction charge for state government. It is possible the newer, better rates are made possible by covering everyone under the tax net. BTW, do prop shops pay all other charges? Nothing has changed on that. Stamp duty is transaction charge for state government. It is possible the newer, better rates are made possible by covering everyone under the tax net. When a brokerage firm trades for itself, you can’t create a contract note. If there is no contract note, there is nothing to be stamped and hence no duty. But yeah, let us see how this goes. All other charges for prop shops who are also members on the exchange is the same. It is already mentioned above, can go through the given link. Here’s a detailed explainer by PWC on the key changes in the amendment. Will this change be effective from 1st April 2019? I dont’ think will happen till the elections are over. All the states have to first agree on one stamp rate. As new rules, are they asking stamp duty from prop desks also? No idea on this yet. I guess all details only post elections. Stamp duty on derivatives…i believe stock exchange or clearing corp will collect on behalf n will pay to the state of residence of buyers. I wonder if these rates have also been rationalised. Securities (other than debentures) delivery basis 0.015%. The budget ushered in stamp duty changes for financial instruments and there’s good news and bad.